Can I just say you guys are awesome! Thanks so much for your understanding and kindness. I read your comments and felt like I was being encouraged and supported by close friends, so thank you so much. So, I'm currently in Utah for my sister's wedding. Actually the wedding was today and it was really nice, low key, simple. The decoration worked out well and despite working on them all day, we were still pinched for time - however, we pulled it off. I'll share pictures once I'm home. If you want pictures now though, and since it's midnight and I can't sleep, here's some pictures from some custom orders that I've never shared. These first items have kind of a cool story. Awhile back I got an email asking if I did custom orders. 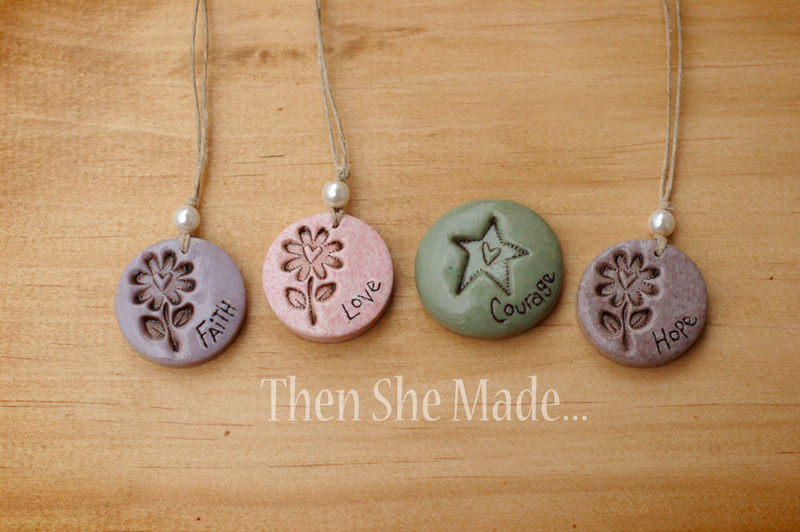 She liked my word pendants and thought they'd be just thing for her family. Her husband is in the military and is getting ready to be deployed soon. She wanted something that could be given to her family that would unify them while he was away. After a few month and some emails back and forth, I made the above items. 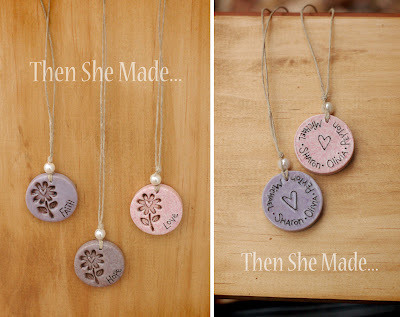 3 necklaces, all different colors with different words on the front. Plus, I made a little pocket pebble. 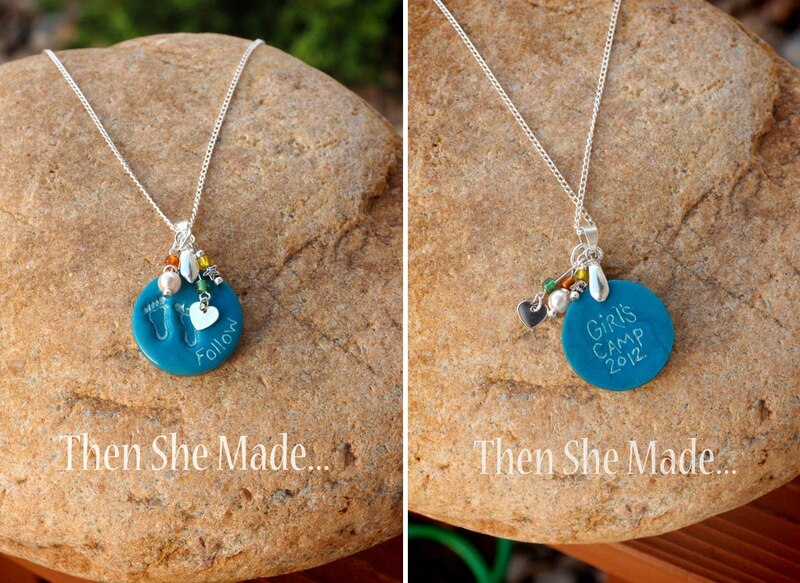 The mom and girls will wear the necklaces and the dad can keep his in his pocket. 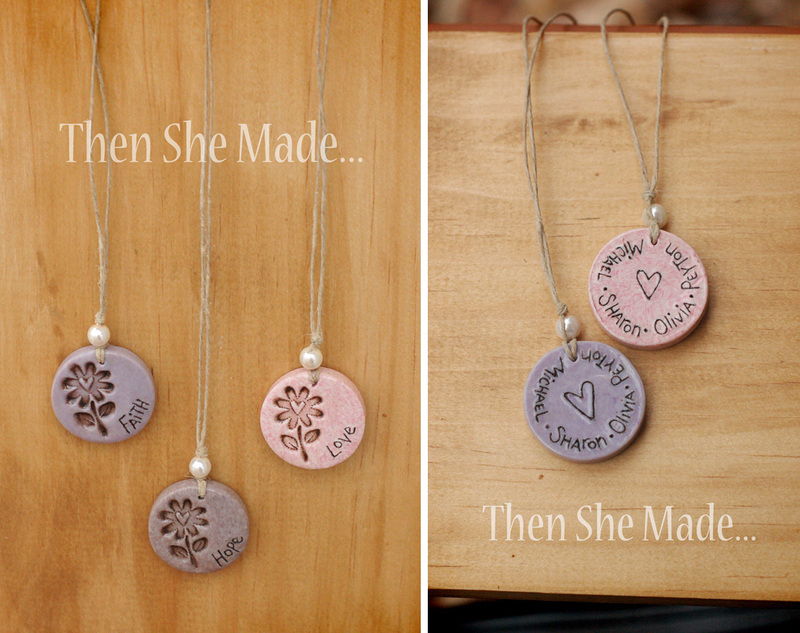 On the back of all of them are the family names with a sweet little heart. I loved this idea and was happy to make a custom piece, I like the idea of the family being unified while the dad is a way. This one is cool too. You've all probably seen my Arise necklaces. I've made a bunch of those for various girls camps and such. But these, these are a little different. 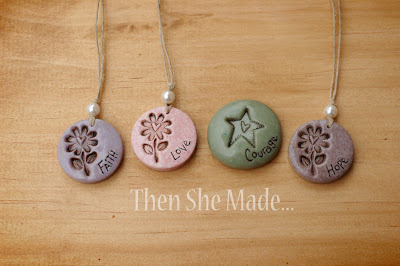 They are for girls camp too but I was asked to make them to fit the theme of guest speaker. She specifically wanted a foot print stamp and the word "follow" on it. Plus we added "girls camp 2012" to the back. The speaker will hand these out at the end of the talk which is on following the Savior. Love it!!! On a side note, when I was playing around with designs and color, I tried it in pink and realized these foot prints would make a fun Mother's Pendant. Feet prints with a child's name. Wouldn't that be cute? And then here's one that I did back in May. I was sent an old picture pendant. It was on a tarnished chain and the back of the pendant, when worn, would turn the skin green. 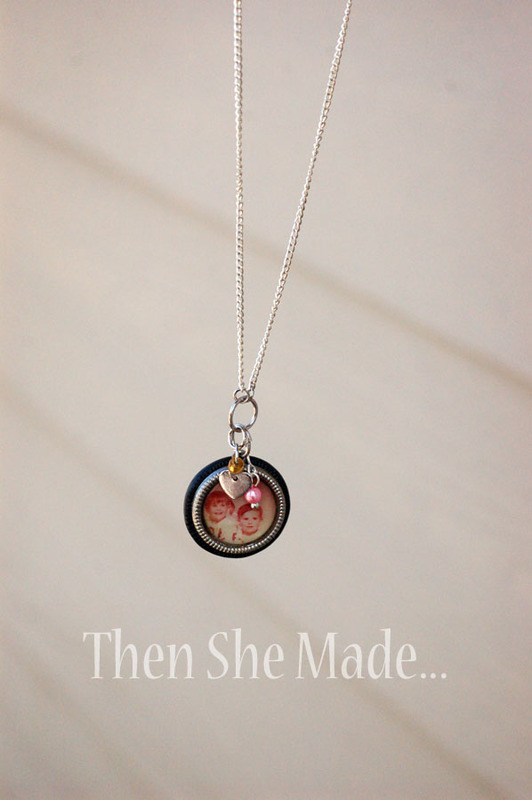 I was asked to set the pendant in clay. I also added some fun charms, sealed the photo with some dimensional glaze and added a little heart to the back. The photo is of two sisters. One of them, being a cool aunt, gave this updated pendant and necklace to her niece for her birthday. I thought that was a pretty awesome gift. Ok, I think blogging is therapeutic, I'm now tired and think I can sleep. Night! You do wonderful work. Hope the fires did not interfer with your sister's important day! Very nice! Hope Liz's wedding was wonderful! Now I hope things will settle a little for you!